If so, we may be able to help you, just like we helped her. Call our office today for your $49 evaluation. The most common method your doctor will recommend to treat your neuropathy is prescription drugs that may temporarily reduce your symptoms. These drugs have names such as Gabapentin, Lyrica, Cymbalta, and Neurontin, and they’re primarily antidepressant or anti-seizure drugs. These drugs may cause you to feel uncomfortable and have a variety of harmful side effects. Peripheral neuropathy is a result of damage to the nerves. It most often causes weakness, pain, numbness, tingling, and the most debilitating balance problems. This damage is commonly caused by a lack of blood flow to the nerves in the hands and feet, which causes the nerves to begin to degenerate due to lack of nutrient flow. 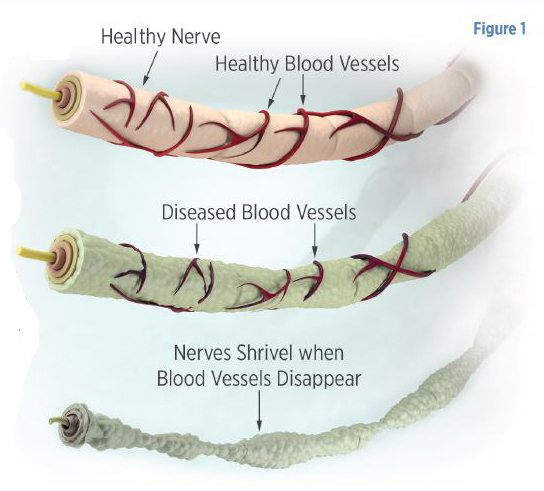 As you can see in Figure 1, as the blood vessels that surround the nerves become diseased, they shrivel up, which causes the nerves to not get the nutrients to continue to survive. When these nerves begin to “die”, they cause balance problems, pain, numbness, tingling, burning, and many additional symptoms. The main problem is that your doctor has told you to just live with the problem or try the drugs which you don’t like taking because they make you feel uncomfortable. There is now a facility right here in Brighton, that offers you hope without your taking those endless drugs with serious side effects. 1) What is the underlying cause? 2) How much nerve damage has been sustained? 3) How much treatment will your condition require? To increase blood flow we use Pulsed Electro Magnetic Frequency Therapy and Infrared Diode Therapy. Your nerves will be stimulated at the rate they heal, not a rate that burns them out. The treatment to re-set the way the brain communicates with the area is called Trigenics. We even have home based programs available to those who have transportation concerns. So, don't worry that we aren’t in your town. You may still be able to get the care you need, in the comfort of your own home. The pictures on the top of this page show the before and after results of the care in our office. This woman was unable to walk on her own, bend over, squat down, and she was very dizzy. Her legs were so bad that when she bumped into her dresser, she did not get a cut; her tight skin broke open and clear fluid came out. Her legs were so swollen that it made the skin stretch tight. She was in constant pain and unable to move. These pictures say a thousand words. Click here to watch her testimonial on our You Tube channel. First, we will do a neuropathy severity examination to determine the extent of the nerve damage for only $49. (The normal cost of such an exam is $257.) This neuropathy severity examination will consist of a detailed sensory evaluation, extensive neurological testing, and a detailed analysis of the findings of your neuropathy. Afterwards, we will sit down and talk about your options. Whether you need an intense in office program or choose to utilize our At Home Program, we will do our best to help you get your life back. The best thing is that it does not include dangerous drugs or surgery.